Friendship- Bonds Beyond Time, is a collection of twenty-five award winning stories, selected and edited by Sarav, and published by Shades Publications. Friendship is that bond, made with the divinity of selflessness, love and care. 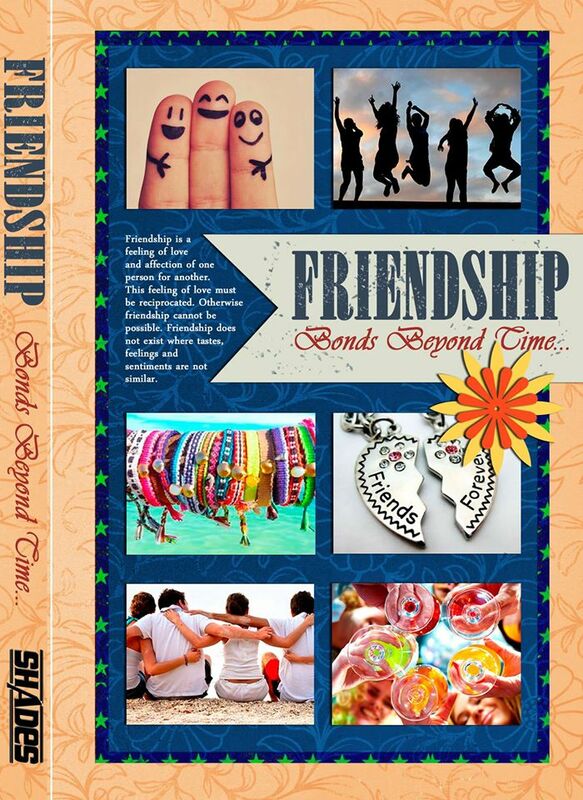 Friendship-Bond Beyond Time is a collection of 25 wonderful short stories defining different shades of friendship. Each story has its own rhythm and expression to explain about that immortal bond. SCARLET’S ROSE: It is a reflection of how Scarlet and Rose completed each other with the hands of friendship; how they define friendship as learning to live, setting an example to new buds about depth of that bonding, how to become ones with friendship. The writer beautifully explains the essence of it; a simply elegant story. A TALE OF TWO MICE: As the name suggests this one is about the selfless connection between two mice bonded over friendship, how they stood for each till the end. In the current lifestyle of selfish race of human, two little mice is an eye opener to the value of friendship and friends. The writing style and out of the box idea about such an eccentric bond will grip you to the story. SAVIOUR: Sometimes its all about finding that real friend who could clear a way for you and support you to move on; to be your saviour in crisis. Saviour shows how Sanjana found such a saviour on a lost bus ride of hers. THE COLORS OF TESU: This one showcase the different aspects of relations including friendship or partnership of a mother-daughter, mother-son and two people and aspiration of dreams with strong support of friendship; and also how the bonding strived over time and getting second chances to re-bond. THE FRIENDLY STRANGER: This is a story of Advi who broke out her shell of being in claws of comparison with her so-called-friend and exploring hidden talents inspired from the music that she connected from that friendly stranger; recreating a stronger and confident Advi. The writing involves you into her world smoothly. SPARKO: This explains how a puppy friend can make a next-door jobless bachelor, a superhero; lucky with job and girl at the same time. Its not only that, there are other lives where sparko could sparkle too. This personal favorite of mine can give surprise, happiness and aw-factors. CAMARADERIE: One chose pen and the other chose gun yet their goals where similar, they held each others back from the day of their ‘mango treaty’ with the strength of friendship. Story of Raghav and Ravi and their Camaraderie; the writing will connect you to Ravi and his insights with ease. THE NEWFOUND SECOND SELF: Matt’s mother had no clue about the mystery of missing food from kitchen and where he went leaving early to school until his father took it into hands to clear the smoke. A brilliant story of Matt and his newfound self, written with that in depth feel that will touch your heart. THE PURSUIT: Amisha , a talented and aspiring actress started finding solace in the post of ‘caregiver’. Their bond was the blissful result of their pursuit for completing their soul. Other than that it may remind you of some movies you watched with similar concept , it is a warm story. FRIENDS FOREVER: MADPAF gang enjoying their last day at hosts with the kick of booze and memories. A typical last- day-of-college events of a group of friends, some secrets to watch out too. A natural atmosphere created by the writer. THE 3 SEVENS: That success funda to have right combination of all genres in writing; Sanidhya , Rinish and Tanya how their strengths combined form a bang on success. There is a story inside the story too which is impressive. Just that all characters, writers meeting up and then in inside story all doctors meeting up is a slight OFF. An interesting work to read. I’LL ALWAYS BE THERE FOR YOU: That sweet relation of friendship between Anwesha and Rounak with slight pinch of love presented in package of warmth and fun. A nice story to chill with. HOMEWORK: Innocent story of two young friends, how one stop for the other in spite of pushing into trouble. Considering it based on true stories; a story with a life! WEEDS OF HAMPI: Enmity is waste of life, friendship is wat gives you meaning.A story of such realization over a very long period of time. The name and the thought behind this is brilliant. SOUL-MATES: A modern version of Radha-Krishna Jodi . A relation that demands your change or to be what you are, selfless love and perfect love and friendship. A wonderful story, written beautifully. THE SCARLET TINT OF YELLOW ROSE: The name itself is a good hold to a reader. Again a friendship turned love and shadow of fear to accept love. Striking writing style adds flavor to the story. THE DEAFENING SILENCE: Story of a group of friends out of different groups in a fashion of Hollywood teenage movie with mixed elements. A different approach to enjoy reading. KHUSHI- A DIVINE SOUL: Sometimes you won’t know the value of people you have until you lose them. About how friendship took second place voluntarily when love entered life. I think the name could have been something else. TRUE LOVE SAGA: Love is not always about getting it, it is sacrifice too. How a friend stood up to bring happiness to his friend’s life being selfless. A simple story depicting deeper meaning of love and sacrifice. THE ELIXIR OF FRIENDSHIP: Friendship valued before love; it’s about how Anuj helps Sameer to create a poet to gain his love. The poem in the story and pinch of fun at end is brilliant. FRIENDSHIP IS THE CURE OF EVERYTHING: Two lost lovers bond over friendship to lead a life purely based on friendship because sometimes a girl and a boy are just meant to be friends. The idea of it is fresh in its own way. SHERLOCK AND WATSON: Here again another interesting name that might hook you. It depicts even a criminal or gangster too have a normal life and deep friendship. The way their connection blooms is something eccentric just like the name. A VISIT OF THE DEAD: A very interesting way of plot to show deformity/faults should not deform the relation of friendship. Writer gives you a life lesson with the story. TWO LITTLE SPARROWS: Status and money can never distinguish friendship . How friendship did what blood could not. A good story to read. FRIENDS FOR LIFE: Friends can go to such an extreme of bond and connection and the same can shattered with a pinch of ego yet getting back together is with ease with rekindled friendship. The changes could have been more reasonable but yes it is a short story. A good one to read.